Until they started showing up in our CSA box, we hadn’t previously cooked with collards. We recently made this quick sauteed version, which was great, but wanted to try something new. 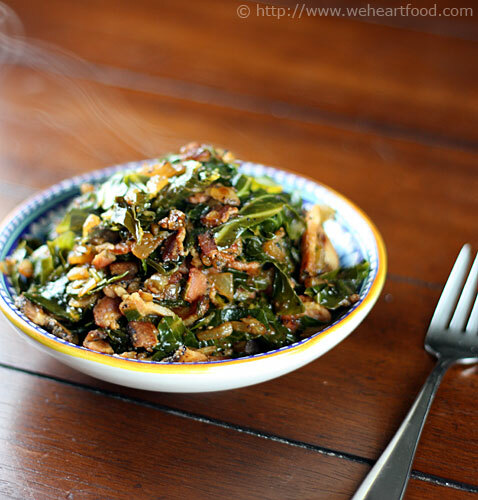 This recipe is adapted from the Food Network and features collard greens braised with sweet onions and bacon. Nothing wrong with that! Bring a large pot of salted water to a boil, then add collards and cook until they wilt and are tender, about 5 minutes. Drain and set aside. Place the pepper bacon in a large frying pan and cook over medium-high heat, stirring occasionally, until crisp-brown and the fat is rendered, about 3-4 minutes. Add the chopped onion and cook until softened, about 4 minutes. Add the drained greens and turn to coat well. Add the chicken broth to cover the collards, and cook until the liquid is reduced and greens are very tender, about 15 minutes. Season to taste with salt and freshly ground black pepper and serve.